Hurrah, it’s December! I am therefore NO longer to be considered crazy for the hours I spend planning, creating, shopping for, and packaging gifts! However, time is of the essence. I require sleep, tea, thrift store therapy, lesson planning time, vitamin C, chocolate, and lots more sleep to get me through this month. So, let’s be brief! For the next few weeks, we will focus on “nifty gifties” that won’t break your budget OR your schedule. Simple technique, simple supplies, simply cute. Done! Now to introduce the first of our nifty gifties, namely the stamped dish towel! 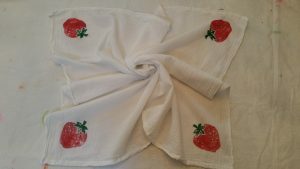 I like buying dish towels (sometimes called “tea” or “flour sack” towels) in inexpensive 5-packs at Target or Walmart. I also hoard foam stamps for painting. These have become harder to find at craft stores in my area, but I have found some online like these snowflake stamps . You could also raid the kid’s aisle for those foam shapes that are sticky on the back. 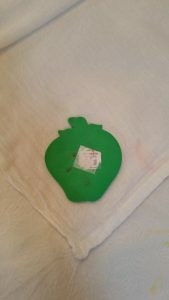 Glue a couple layers of the same shape to a jar lid or wood block and you have a stamp! 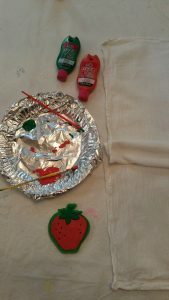 I use the “Soft” fabric paints from Tulip because, unlike the “puffy paints” of our childhood, these paints lay flat on the fabric. My paint brushes are of the plastic-kid’s-art box-variety, since they will inevitably get full of paint. Before you can start painting, you MUST wash, dry, and iron your towels. It’s a pain, but you cannot afford shrinkage after painting or wrinkly surfaces to paint on! Christmas is coming, so start washing! Now, prep your surface for efficient work and easy cleanup. I cover my work table with a plastic shower curtain turned tablecloth. You will also need some protected surfaces where you can lay (or hang) your painted towels to dry. 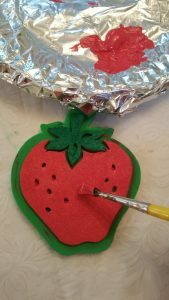 Once the surface is prepped, spread out the towel and squeeze a little paint onto your pallet (or in my case, foil-covered paper plate). 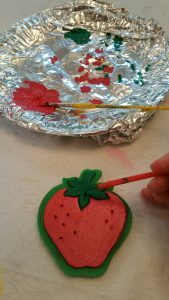 Using a different paintbrush for each color, paint a thin layer of paint onto the stamp. Do a couple test stamps on a paper towel to get the hang of it. Flip that stamp over onto your towel and apply even pressure to the back of the stamp. Carefully take the stamp off the towel and enjoy your stamped image! Repeat as many times as you like. 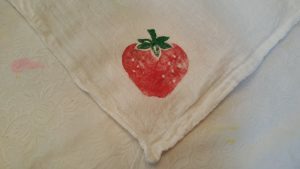 Since my stamp was pretty large, I just stamped one strawberry in each of the towel’s corners. You could also paint a more detailed stamp with a greater range of colors to create an image with more depth. Using this grape stamp definitely took more time, but yielded pretty results. 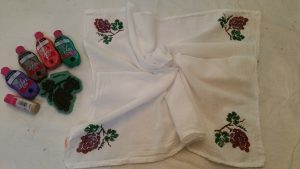 Your towel will be dry to the touch in about 20-30 minutes, but give it a couple hours to fully dry before you fold or wrap it. 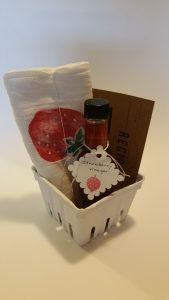 Speaking of wrapping, I paired stamped towels with little bottles of the berry infused vinegar I made this summer! These turned out so cute, that I can’t wait to give them as gifts! Stay tuned for more Nifty Gifties coming soon!